Say hello to Toby, a 2 year old #American #pitbull /#Golden #retriever mix! Isn’t he super #handsome? He’s a fun, #happy guy with a good overall temperament. We have such a good time together; we #laugh and play all day! I #love spending time with him; he is such a great #friend and listener. However, Toby is a little bit of a scaredy #cat so he does need some time to warm up to others. When it comes to other #dogs, he’s better with calm, submissive females. Will you #adopt him and give him a #furever #home? If you are interested in adopting him, get at me, dawg! Comment or DM me here or tweet my Mama @kelsey_cruz. He is from @arlofberksco and needs a wonderful #home so you can always email them directly from their web site berksarl.org to learn more about #Toby and how you can #adoptnotshop him! And remember, #KING is #wheredogsrule. Meet Lucky, an 8 year old #Labrador #Retriever mix! Isn’t she #beautiful – she’s my #wcw! She’s a sweet, older gal who is looking for a comfy couch, a loving #family, and snacks! Lucky isn’t feeling so lucky since she lost her #home, but she’s trying to persevere. She’s fun, smart, and old enough to know better but young enough to play, be engaged, and keep everything interesting. Lucky needs to be the only dog in the house, but with her awesome personality, she’s all you’ll need! Will you #adopt her and give her the #furever home she wants and deserves? If you are interested in adopting her, get at me, dawg! Comment or DM me here or tweet my Mama @kelsey_cruz. She is from @arlofberksco and needs a wonderful #home so you can always email them directly from their web site berksarl.org to learn more about #Lucky and how you can #adoptnotshop her! And remember, #KING is #wheredogsrule. #HappyNewYear from Buddy! Isn’t he #handsome? He is a #retriever #terrier mix that is between 2-4 years old and weighs 62 pounds. He is so much #fun; we #laugh and #play all day! 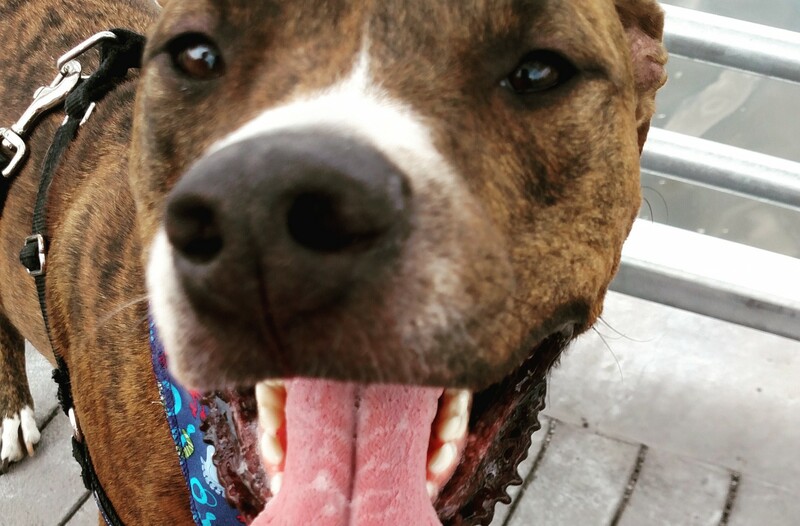 He is a #big, #friendly goofball who just #loves having a good time and making everyone around him #happy. He enjoys playing with his #toys and fetching them, so if you throw one, be prepared to keep at it for a while – he never tires! He is very well-behaved and well-mannered and would do well in a home with other #dogs and children; however, the verdict is still out on how he feels about #cats. Sadly, Buddy was found as a stray. Will you give him a #furever #home for the new year? If you are interested in adopting him, get at me, dawg! Comment or DM me here or tweet me @wheredogsrule. He is a @phillypaws boy in need of a wonderful #home so you can always email them directly at dogs@phillypaws.org to learn more about #Buddy and how you can #adoptnotshop him. And remember, #KING is #wheredogsrule.